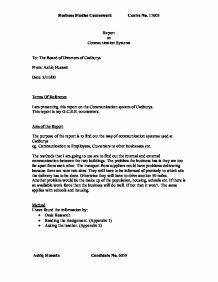 Report on Communication Systems To: The Board of Directors of Cadburys From: Ashiq Hussain Date: 3/11/00 Terms Of Reference I am presenting this report on the Communication system of Cadburys. This report is my G.C.S.E. coursework. 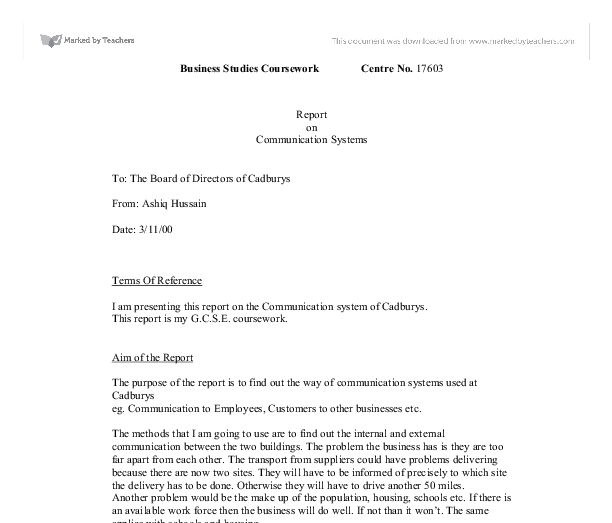 Aim of the Report The purpose of the report is to find out the way of communication systems used at Cadburys eg. Communication to Employees, Customers to other businesses etc. The methods that I am going to use are to find out the internal and external communication between the two buildings. The problem the business has is they are too far apart from each other. The transport from suppliers could have problems delivering because there are now two sites. They will have to be informed of precisely to which site the delivery has to be done. Otherwise they will have to drive another 50 miles. Another problem would be the make up of the population, housing, schools etc. If there is an available work force then the business will do well. If not than it won't. The same applies with schools and housing. Method I have found the information by: * Desk Research * Reading the Assignment. (Appendix 1) * Asking the teacher. (Appendix 2) Findings The Main Background Cadbury's world is a Limited Company, which basically means they have limited liability and it is owned by shareholders. This means it will be easier to run and you can decide who can and cannot buy shares because if it was a PLC anybody can take over if they have the most shares. It provides whole range of products such as chocolates, sweets, drinks and educational talks. It is a medium sized manufacturing company employing 120 people. Until this year production and administration has been located in central London. There has been a reorganisation of the company and its personnel. The Board of Directors, Managing Director, Finance Director and the Administration Director work at the London Head Office. ...read more. Method of Communication There are three basic forms of communication: spoken, written, and visual. Each may be used in different circumstances and some of these are shown in the diagram below: external network Telephone Spoken internal network words interviews Face-to-face - groups meetings Information Memos Notices Reports May be communicated in Written Letters Standard forms Many different ways words Published reports Electronic facsimile, telex prestel, Visual charts, diagrams, tables, films electronic mail confravision advertisements press releases As you can see the communication starts of electronic and goes to spoken, written and visual. Spoken People spend a great deal of time talking and listening to others at work. This takes place between two people on a one-to-one basis, or on the telephone, or when one person talks to a group, or when several in groups discuss things together at a meeting. Advantages are that the sender conveys information quickly, views and ideas can be discussed, feedback is immediate and the process can be in formal and personal However, no written record is provided, so the message may be forgotten (therefore may be unsuitable for long complicated details) and as a result of long group discussion, decisions may take longer to make. Letters Letters enable an accurate, clear message to be sent. They are used mainly as a means of external communication, but are also used internally in connection with such matters as appointment or dismissal of staff. Advantages of sending letters are that it may be cheaper (especially over long distances) than other methods such as the telephone or telex, it is easier to communicate in a foreign language because more time is available for translation and formulating a reply and a letter provides a permanent record of events. However, letters may be time consuming, they are slower than telephone calls, they may also be more formal and less personal. The sender does not get immediate feedback and there is a danger that the person to whom the letter is addressed may never see the document, because, for example, correspondence is often dealt with by secretaries. ...read more. - mobile phones I got this Information by analysing the two companies As you can see that the bigger the company the more communication is needed because its big and it also has to be more established which might not be as competerised as Office club. You also need tele- conferencing because it's so big you will need to see everyone from where you are. Whereas if you're a small company you will not need as much communication methods because you see everyone face 2 face. Office club is a company who looks for business whereas Cadburys Ltd advertises them and people should come to them. Here are the Communication methods at Office club and Cadburys Ltd: As you can see that Office club use a lot of electronic methods this is because it is a company, which publishes brochures, leaflets, catalogues etc. There is not a lot of external and written methods because it is a small company which is in one building therefore it does not need a lot of these methods. Verbal communication is used to tell them at meetings face-to-face what is required of them. This happens most frequently because they have new deals and new companies, which they have to publish for. They use quite a lot of telephone because they look for business and for new customers. I think by looking at this you can tell that it is a company that has got something to do with computers and it is a publishing one because it uses a lot of telephone and electronic methods. As you can see this pie chart is completely different to Office Clubs one because it uses more external, verbal and electronic which they need more than telephone and written because they are not like a purchasing company which need telephone a lot also they do not go looking for business like Office club does. This pie chart is not so obese because you cant really tell it is a factory selling products. ...read more. This student written piece of work is one of many that can be found in our GCSE Communications section. ICT Evaluation of my materials produced for a &amp;quot;Get Moving&amp;quot; health campaign. Another way I faced issues was to simply search on Google, for example when I was doing my ?investigation and profile? I didn?t know what many of terms were so I searched them on Google, words such as ?BMI?, ?Activity Levels?. These are used in Tesco in the automatic doors. Process A process is an operation performed on the data. In Tesco, someone would want to buy something (input) and then the sale would be the output and the process would be what happens in the middle. Like all the recording of what the customers want from the loyalty cards. No record is usually kept. Telephone The telephone is a form of electronic communication, which provides fast communication within an organisation and with others outside the organisation. People can be contacted on mobile phones in case of an emergency or urgency. With SK-II competitors just a mouse click away, SK-II not only should offer the right price, but also the right pricing strategy for a particular customer and situation. It is therefore, pricing of SK-II should get personal, with customized price being offered to each and every buyers. Development of a set of marketing recommendations, marketing mix campaign and customer care initiatives. Generally Safeway like other Supermarkets has numerous offers. Some products are reduced to half price, buy one and get one free, these offers are particularly familiar. Some Supermarkets are reducing prices of many products to attract customers and increase their market share. poor telephone line. Tesco being a large company with 729 stores in the U.K, 979 stores nationally, and employing 280 million nationally, means they have to use reliable sources of communication in order to run an efficient business. I will find out the most poular and efficient method. Although this law is in place, it can be broken and the fines are simple, harsh and understandable. Prison Or unlimited fines. I stayed within these laws by checking with the network manger that the software I used was under a proved license. The wide variety of games means that even if guests do not like a particular genre of game, there are many more which they may like. My games console is great as it is to most a new form of entertainment which means that I can amuse my guests easily.